There are few vehicle manufacturers around today that can trace the design of their engine back more than a couple of decades. Royal Enfield is one and Harley-Davidson is perhaps another. Neither of these can really compare though to the BMW R model motorcycles. The engine was created by engineer Max Friz in 1922, and first appeared in a Victoria (see The Victoria Ventures) as BMW was initially an aircraft engine producer, and then after WWI turned to other engines. The basic layout of the engine is a logitudinally mounted crankshaft with horizontally opposed pistons sticking out either side. The configuration has remained in use up until today, and has a pretty good chance of being around for it's 100th birthday, despite the introduction of several "successors" along the way. 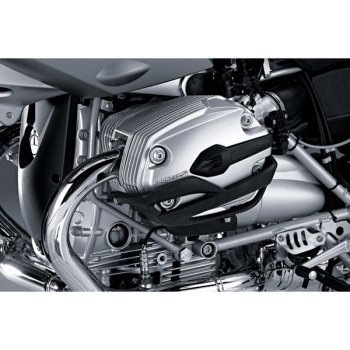 Obviously, despite the basic design being the same, much has changed internally within the BMW R motor. Materials, electronics, camshafts, etc., have all changed dramatically. Much has also changed around the motor,as well, with the frame evolving from a basic cradle to now having the engine as a stressed element. One element though that has been visibly there from the beginning until now, is the valve cover. Perhaps because it is the outermost visible element of the engine, or perhaps because it has served essentially the same function from the beginning, the valve color serves as one of those markers of evolution for this engine configuration. It is an important visual element that amplifies the engine layout. With all due respect to K bikes, F bikes, and others, nothing says BMW like pistons in the breeze. The valve covers have served a multitude of purposes overtime due to the engine configuration. One of its purposes was protection of the valvetrain, as it is with any engine. Even from the beginning, it was evident that while there were advantages to the engine layout, it was a clear disadvantage in terms of lean angle for the motorcycle. This resulted in many different tricks such as mounting the engine higher within the frame, low-profile valve covers, and other innovative approaches to the problem. More than a few valve covers were ground down as a result of dragging in the corners. My 1980 RT has a nicely sheared valve cover courtesy of a previous owner. The valve covers have also serve as a styling element. As mentioned before, they were and outwardly visible elements of the motorcycle and served as an opportunity to enhance or accents the lines. They could also help to accentuate the engine, or help it fade into the background. The shape of the valve cover has also changed a little overtime. Even though most have been oval-shaped, there have been interesting variations over time. 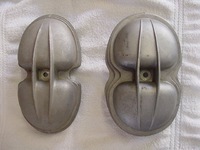 There were two piece figure 8 shaped valve covers, more angular ovals such as on the 1980s airheads, hexagonal shaped covers on the hex heads, etc. smooth covers early on, multi-finned, engine-colored, black, chrome, etc. Of course, the cylinders stuck out the sides of the engine for a reason. They were able to gain the maximum cooling effect by being placed in this position. If you look at the R32 from 1923, you can clearly see evidence of this as the cylinders were finned even on a side valve motor. Quickly following that, was the appearance of overhead valves, and the valve covers in the position and shape that we see today. Similar to the finning of the cylinder heads themselves, valve covers have at various times been recruited to help with cooling by gaining fins and in general maximizing surface area. Today, fins are less important with oil-cooling, and soon-to-be water-cooling (!) 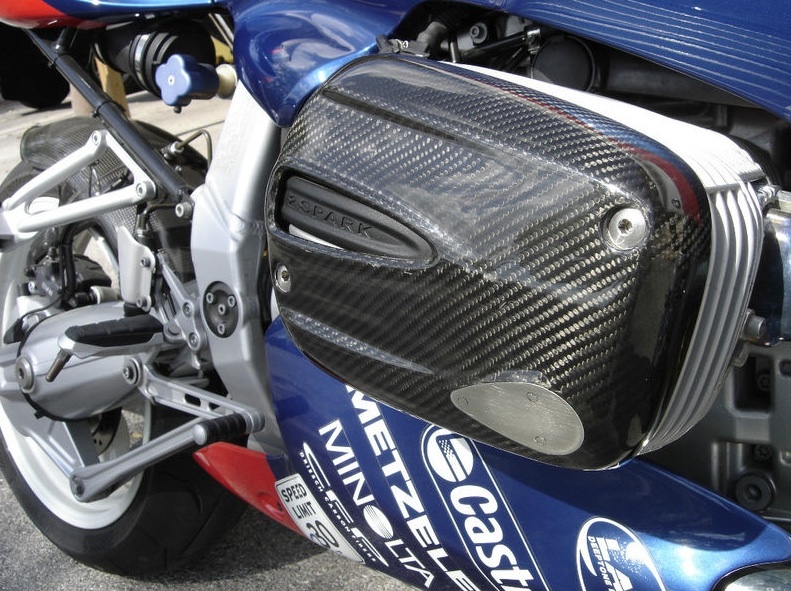 Most newer bikes also have a valve cover protector of some sort in place, and/or engine bars, so protection is less of a primary function as well. Ironically, the valve cover is emphasizing its role as a distinctive visual element of the R bike.